Israeli PM Netanyahu has given a speech blaming Haj Amin al-Husseini, the Mufti of Jerusalem, for the Holocaust. According to Netanyahu, Hitler originally planned to expel the Jews, but the Mufti protested that they would come to Palestine, and urged Hitler to kill them instead. 1)	Netanyahu’s story is historically inaccurate: the genocide against the Jewish people was in place during the Nazi invasion of Russia, well before the Mufti’s meeting with Hitler in November 1941. The Mufti did not know about the mass extermination camps until much later in the war. And Hitler did not need the Mufti to inspire him to launch the Holocaust. However, it is true that the Mufti objected many times to proposals to allow Jews to leave Europe, due to his fear that they might come to Palestine, and as a result thousands were killed. Yet Rubin and Schwanitz’s claim also has serious, troubling implications. Where did al-Husaini’s passionate hatred of Jews come from? Indisputably, from the Jewish colonization of Palestine. So, if you follow Rubin and Schwanitz’s logic—as they themselves fail to do—Zionism is responsible for the Holocaust. No Zionist colonization of Palestine would mean no Arab anti-Semitism, which means no al-Husaini, which means no Final Solution. The authors use a historical life to advance their political reading of the Arab-Israeli conflict—without thinking through the risks of loading their political agenda onto historical analysis. Who comprised the battalions of this “warring people” whom Stephen Wise ordered into the midst of battle? In the front lines stood the prisoners of the ghettoes, a vast army of six million men, women and children – fuel for the crematoria. Stephen Wise sat secure at a safe distance from the dangers, while in the name of the helpless, he declared war against mighty Germany. 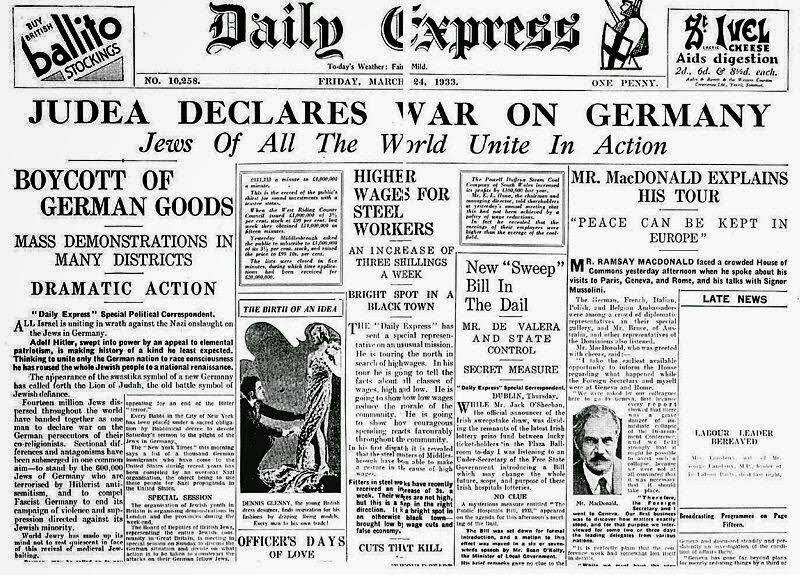 Already in 1933, this “war against Germany” had begun. In March, 1933, when Hitler became the undisputed leader of Germany and began restricting the rights of German Jews, the American Jewish Congress announced a massive protest at Madison Square Garden and called for an American boycott of German goods. These are the "statesmen" who organized the irresponsible boycott against Germany in 1933. 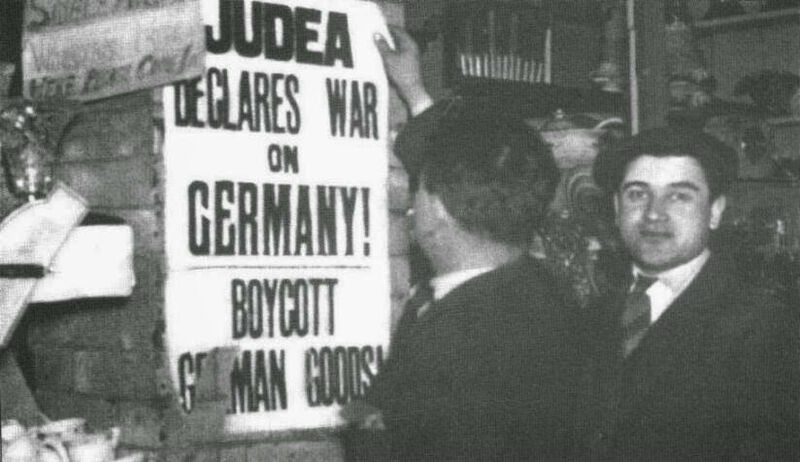 This boycott hurt Germany like a fly attacking an elephant - but it brought calamity upon the Jews of Europe. At a time when America and England were at peace with the mad-dog Hitler, the Zionist "statesmen" forsook the only plausible method of political amenability; and with their boycott incensed the leader of Germany to a frenzy. But [the Zionists] do the opposite [of the path of Yaakov Avinu]: they provoke the nations in a terrible way, recklessly abandoning the blood of Jews. Did they not declare war against the terrible enemy in Germany? And then his voice was heard on the radio saying, “The Jews declared war against me, therefore I will answer them.” And so he did, unfortunately: right afterwards, the frightful killings began. It is impossible to understand how they could be so cruel, knowing that a large percentage of the Jewish people were under his power, and they could do nothing about it – how could they be so cruel and abandon Jewish blood? And they did many other such things that caused the loss of Jewish lives, unfortunately. Some of them are brought in the book “Min Hameitzar” written by my late friend Rabbi Michoel Dov, may he rest in peace. Click here to download the book The Holocaust Victims Accuse. Click here to see other free online books.